They say you only go around once in life, but in 2009 Trixie and I went around, and around and around once again. Showing at seven FOSH Sanctioned and/ or Affiliated shows and entering the ring 61 times, proved to be what it took to earn such a title and what an experience it was. Trixie and I have been together just over 2 years and it has been a whirlwind from day one. I purchased Trixie from Bud and Tori Blankenship in December of 2007 after showing her for them in South Carolina and at a few Florida shows, actually winning my first garland with her at one of the FFTA shows. It was apparent that Trixie and I were a “match made in heaven”. In 2008 I decided to join the FOSH (Friends of Sound Horses) organization after hearing about them and what their mission was. Trixie does everything so naturally and willingly that I figured we might as well see how we would do in the way of FOSH Points. 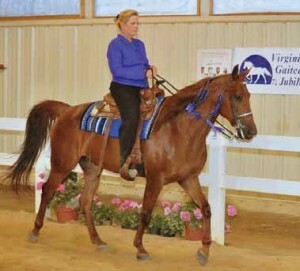 The 2008 Virginia Gaited Jubilee was the highlight of that year. Never placing lower than 3rd place, we were named the 2008 Reserve Champion of Region 1. Along comes 2009 and Trixie and I were still going strong and still having a blast together. The Florida State Fair was a true testament of the Fox Trotter’s ability, sensibility and tolerance. The weather was the coldest in Tampa’s history, with a stiff wind and, even with the weather being what it was, the roller coasters were still going like crazy. I was hesitant in going but knew how important it was. It turned out to be one of the best shows I have ever ridden in. Winning all of her halter classes, including Open Gaited Breed Halter Grand Championship both days, we were off to a great start. The rest of the 2-day show was just as impressive. Winning Reserve Best Gaited Horse in Show was the icing on the cake. In June of 2009 we were back in Virginia for the Gaited Jubilee where Trixie was the Reserve Foxtrot Grand Champion and the Reserve Open Gaited Breed Country Pleasure Grand Champion. Trixie has proved to me, and many others, that Fox Trotters are capable of doing anything asked of them. At all of the 2009 shows, Trixie was asked to perform in Foxtrot Performance classes, Trail and Country Pleasure Classes, in-hand Halter and Showmanship Classes and Trail Obstacle Classes. Whether asking her to collect and perform her beautiful Flat Walk and stylish Foxtrot or, in the very next class, asking her to relax, walk and trot on a loose rein and become the ideal pleasure horse, Trixie always did what she was asked. Her natural talent and beauty came through no matter what. I could not be more proud than to have her named the 2009 Horse of the Year. Now eight years old, 2010 will be her last year in the show ring. With a youth rider on her back this year at the Florida State Fair, Trixie was awarded two Grand Championships, again being named the Open Gaited Breed Halter Grand Champion for the second year in a row, and three Reserve Grand Championships in Youth, Country Pleasure and Trail Pleasure. She has a couple of more local shows and will go back to Virginia one last time, hopefully having some time to explore the beautiful trails that about the show facility, but after that we are hitting the Florida trails for some much needed R & R. I’m excited to see what the future holds for me and Trixie. Who knows, maybe there will be a “little” Trixie in her future sometime soon. 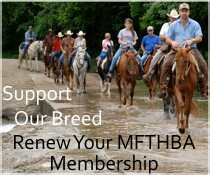 FOSH has provided me and so many others a new place to show our horses. A place to meet new friends, rekindle old friendships and, most of all, a place to show our horses in an forum that challenges them and their riders against some of the best gaited horses in the country, be it another Fox Trotter or one of the many other gaited breeds. To Bud and Tori Blankenship, thank you again for making my dream horse become a reality. She’s a keeper for sure! By the way, if I ever do hit the lottery, that last payment will be on its way (very big grin! ), I’ll even deliver it in person. Thank you all for letting me share my story with you and thank you to FOSH for this incredible honor. And finally, thank you Trixie for being one of my best friends, my trusted mount and for putting up with me day in and day out. You have given me the confidence that, even at my age, I can do anything I set my mind to and do it successfully and at a Foxtrot!